Mark Prentiss holds a bottle of finished True Mountain Maple syrup up to the light. INDUSTRY - The maple trees of Federal Row are no rookies when it comes to sap production. The trees have been pumping it out into tin buckets, and later, blue tubbing, since Mark Prentiss was just a kid. 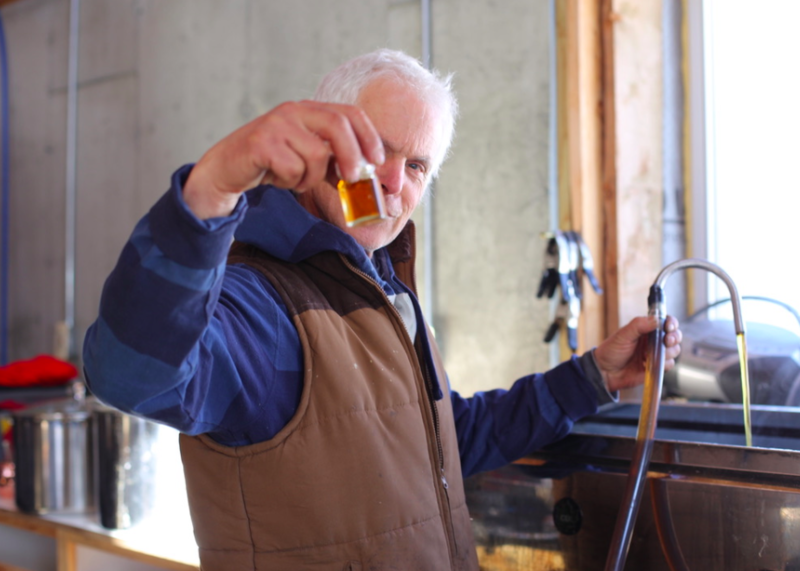 He and his dad used to collect and boil, rationing the results throughout the rest of the year until spring rolled around again. In 1980 Prentiss bought his own 40 acres two miles up the road. "From family operation to a business," he said. 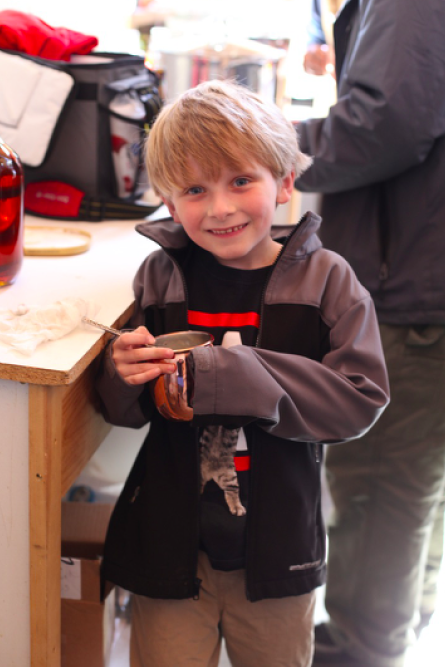 6-year-old Jack Puffer enjoys some True Mountain Maple over a scoop of vanilla ice cream. Prentiss and his wife Kim are in their third year with True Mountain Maple and celebrated only their second Maine Maple Sunday yesterday. So far this season they've collected 600 gallons of sap from 2,800 taps and have bottled 130 gallons of syrup. "It's been a slower year, but the sugar content is higher," Prentiss explained. The sap has a sugar content of three percent this year, compared to the typical 1.8. Prentiss said that means the trees are shooting it up to their branches at a much faster pace, sending it to the buds for spring. "It's a little scary because it means the season could end really quickly. It will be interesting. 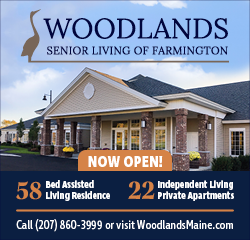 The snow pack could slow it down," he said. But just like any farming business, there's no control over mother nature and in Prentiss' opinion, that's the fun part. A crowd of friends, family and Maple Sunday celebrators visited the farm to see the operation, taste some samples of maple-sweetened snacks and buy some jugs of the precious pancake topper. Perfect spring weather greeted the day, celebrated across the state (and, supposedly, into Vermont...)- the type of spring day that Mainers look forward to come mid-March when yet another blizzard hits. A small crew of dedicated friends help operate the huge evaporator and sell True Mountain products. "It's fun. I can picture myself doing it until I'm 80," Prentiss said. One of the best parts, he said, is the forestry aspect. "It's fun to see the trees grow, and know that my grandson will be tapping these trees 20 years from now. Knowing that we're leaving a family legacy," he said. To learn more about True Mountain Maple click here and like them on Facebook here. 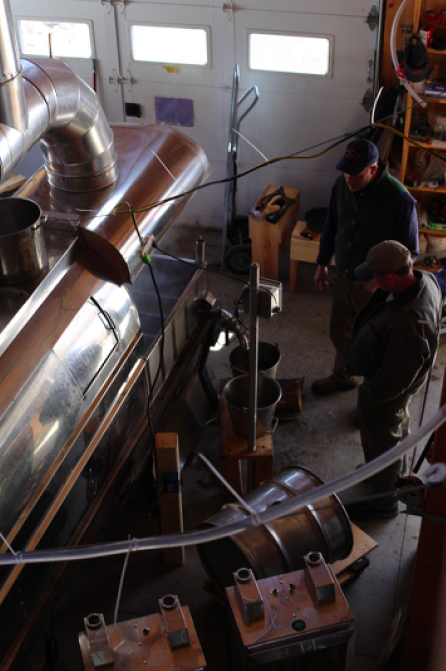 Friends help operate the evaporator on Maine Maple Sunday. I ran out of my own, :0). Sorry I couldn't make the Open House. Congratulations, again - your operation is first-class! And your product is delicious. See you sometime this summer.